William ‘Twooopair’ Reymond has won the WSOP.com online event and the first online bracelet of 2018. 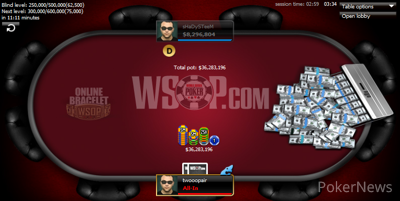 He took down Event #10: $365 WSOP.com ONLINE No-Limit Hold’em for $154,996. The tournament had a field of 2,972 players, making it the biggest online tournament held in Nevada. A total of 333 players cashed for a share of the $974,816 prize pool, but it was the final table where the majority of the money was won, as well as the hallowed WSOP gold bracelet. The nine players at the final table all came from the USA and they battled it out until 3:50 a.m. 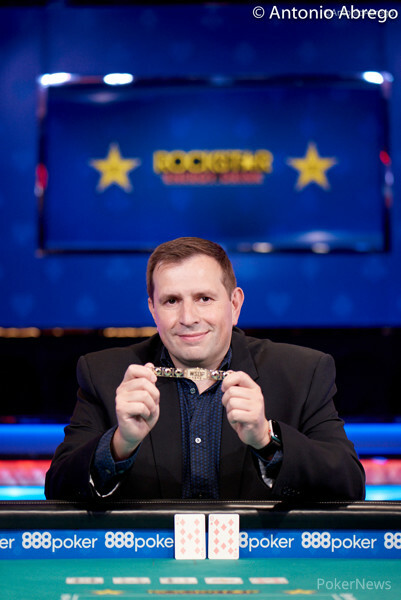 It was Reymond who eventually beat Shawn ‘sHaDySTeeM’ Stroke and won the event for $154,996 and a gold WSOP bracelet. ‘moistymire’ was the first player to be eliminated at the final table. 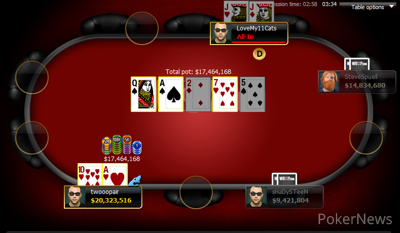 They were already fairly short when the final table started and in one of the first hands, they jammed king-ten suited into the ace-king of chip leader 'LoveMy11Cats'. The board ran out clean and there was nothing ‘moistymire’ could do. ’myapologies’ was next to be sent to the rail. In the end, they couldn’t win a flip with pocket eights against the ace-jack of 'Ekampen05'. The board gave both players a full house, but with the jack on the turn ‘myapologies’ was sent to the rail in eighth place. The third player to leave the final table was ‘nowb3athat’. Unfortunately for them, they ended up running pocket jacks into pocket aces of 'SteveSpuell' as their final hand. There wasn’t much of a sweat on the board and ‘nowb3athat’ was well and truly beaten and exited in seventh-place. The player eliminated in sixth place was ‘YoelRomero’. After picking out an unfortunate time to push all-in they weren’t able to hit with king-ten against ace-queen of 'sHaDySTeeM'. The virtual dealer dealt a queen on the turn and ‘YoelRomero' didn’t manage to hit a king to save himself from elimination. Five-handed play went on for a while and the short stacks managed to double up seven times. It was eventually ‘Ekampen05’ that got sent to the rail in fifth place with a bad beat, their pocket jacks losing out to the ace-ten suited of 'LoveMy11Cats'. While ’LoveMy11Cats’ was the player who sent ‘Ekampen05’ to the rail they were sent home the exact same way a couple of hands later. ‘LoveMy11Cats’ couldn’t win with pocket jacks against the ace-ten of hearts of 'Twooopair' who made just a single higher pair to take play three-handed. Three-handed play didn’t last very long. In what you might call a set-up there was a classic race between ’SteveSpuell’ holding ace-king and the pocket queens of 'Twooopair'. The board ran out with two pair nines and fours, meaning the pocket queens won the hand with nines and queens. 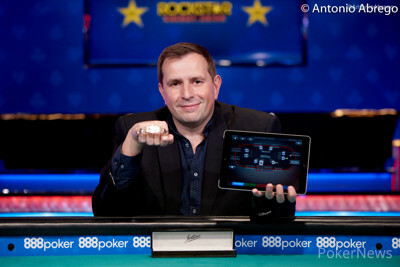 ’SteveSpuell’ hit the virtual rail, narrowly missing out on the heads-up and his shot at WSOP gold. The heads-up battle wouldn’t take too long as ‘Twooopair’ held a 7:2 lead, with ‘sHaDySTeeM’ only having 20 big blinds. After a couple of minutes, the two got the chips in with ‘sHaDySTeeM’ holding king-three of spades and ‘Twooopair’ holding ten-nine of diamonds. ‘Twooopair’ flopped three of a kind and the board bricked out. ‘Twooopair’ gets the first place prize of $154,996 and a WSOP gold bracelet, while ‘sHaDySTeeM’ had to settle for second best and a payday of $94,265. All the chips went in pre-flop and it was 'Twooopair' that needed to hit with and 'sHaDySTeeM' that needed to hold with . The flop was and 'sHaDySTeeM' needed to hit runner runner cards to double up and stay alive. The turn was a and gave 'sHaDySTeeM' flush outs. The river was the and that eliminated 'sHaDySTeeM' who just misses out on the gold bracelet. 'SteveSpuell' just got eliminated in the most classic of races. 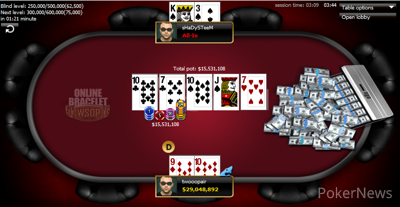 In a massive 31 million chip pot, 'SteveSpuell' needed to hit an Ace or a King against the pair of queens of 'Twooopair'. As the board ran out it was 'Twooopair' who won the hand with a higher two pair than 'SteveSpuell'. 'twooopair' is now heads-up against 'sHaDySTeeM' with a 7:2 chip lead. 'LoveMy11Cats' just got eliminated the exact same way they eliminated the 5th place finisher. 'LoveMy11Cats' held and needed to hold against the of 'Twooopair'. As soon as the virtual flop was dealt there was an ace on the board. The complete board was and that sent 'LoveMy11Cats' to the rail. 'LoveMy11Cats' got it all-in again with the same hand as before, . This time they had to win against the of 'Ekampen05'. The board ran and this time 'LoveMy11Cats' did manage to hit a three-outer. 'LoveMy11Cats' opened with a raise to 800,000 from the button and 'SteveSpuell' went all-in from the small blind. 'LoveMy11Cats' dove into their time bank, but they eventually made the call. The board ran out and 'SteveSpuell' doubled up. Event #10: $365 WSOP.com ONLINE No-Limit Hold'em Starts At 3:30 p.m.